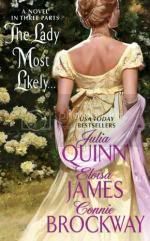 Why I read this book: It sounded interesting and Julia Quinn and Eloisa James are on auto-read. The Lady Most Likely was marketed to me heavily on Facebook. It was toted to be "a novel in three parts". What these authors decided to do was to have a powwow, come up with a general story and have each write a section: beginning, middle and end. Sounds quite intriguing. Could they pull it off? Would the hero act the same in part one as he did in part three? How would the inner monologues change between the three sections? I was quite curious. Unfortunately, when I started reading “the middle” I realized that it really wasn’t a novel in three parts but an overlapping anthology. Each “part” had its own mini-romance all centering around a house party in the country. Time wise they interacted and overlapped, but you can tell the focus shifts with each author. The downfall of our story was that we had the most basic of beginning storylines, with each having a character to call our own. The stories never got anywhere and things sort of died off. I figured what we lacked in experience of ours would be rectified in these three awesome authors coming together to create a story. It just didn’t work for me. They should have just called it an interlinking anthology and then maybe I would have felt better. Outside of the premise, the story was just okay for me. It is hard for me to like romantic short stories because everything seems too rushed and unbelievable for me. (And I already suspend enough reality as it is.) These are great authors, I just don’t think that this work best exemplifies who they are. I would recommend it to someone who wants some quick, light romance. Interesting! I've never heard of this before. I judge books by their cover, and I don't think I would have picked this up :P Haha! "The Notebook" thing sounds SO fun!